As much as we love the look and scent of real Christmas trees, they are more tempting – and often more dangerous – for our furry friends. The needles on a real tree are sharp and could injure a curious cat. 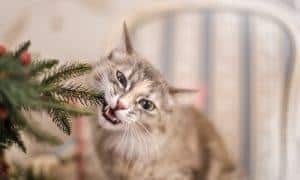 Additionally, pine needles are mildly toxic if your cat chews on them, and can irritate the stomach and mouth, causing drooling and even vomiting. 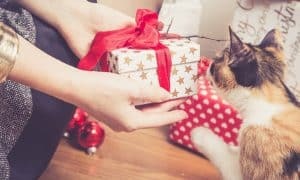 So, consider getting an artificial tree and then following our additional tips to keep your cat out of it. If you are dead-set on putting up a live tree, be sure to also use a covered tree stand so the water tank can’t be accessed by your kitty. Often times, live trees are sprayed with pesticides and fertilizers and those chemicals will leach out into the stagnant water in your Christmas tree. If your cat drinks the water, it could have deadly consequences. Make sure you put your tree up in a very solid tree stand. When the tree is up, it shouldn’t wobble on its base but should be firm and stable. In addition, anchor your tree to the wall or ceiling. These precautions will ensure your tree won’t topple over should your curious kitty decide to climb or pull on it. Put your Christmas tree in an area that leaves it plenty of room on all sides. Make sure you don’t have any shelves or furniture too close to the tree that might act as a launching pad for adventurous kitties to use to jump or climb the tree. If it’s possible, put your tree in an area that can be closed off from your cat at night or while you’re away. If your cat is showing a lot of interest in the tree, try using deterrents to discourage him from going near it. Cats are repelled by citrus, so you could place orange peels under the tree. Or, use a spray like Bitter Apple or diluted Citronella oil on the tree to make it unpleasant for your cat. For cats who like to climb the trunk, wrap aluminum foil around the base of the tree. Choose shatter-proof ornaments that won’t break and become a hazard if your cat does manage to knock one off the tree. Never use tinsel on a tree if you have cats! Tinsel is extremely hazardous for cats and can cause an intestinal blockage if they ingest it. Avoid artificial snow – it’s toxic to pets and children. Many people decorate their trees with food, like popcorn garland, chocolate, and candy canes. 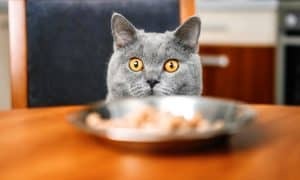 If you share your home with a cat, avoid tempting him by hanging food from the tree you want him to avoid. And, be aware that many “people foods” are dangerous for cats. Place delicate, dangly, and especially enticing ornaments higher up in your tree. Don’t hang any ornaments of interest at your cat’s eye level. Dangling wires from your Christmas lights can prove to be as much of a temptation to your cat as a swinging ornament! Don’t leave your wires hanging around for cats to play with or, worse, to chew on. Instead, wrap wires around the base of your tree and then cover them with a tree skirt. If your cat likes to chew on wires, you can cover them with tape or run them through a piece of pipe to protect them. Decorate with lights that will automatically shut off if the wire becomes damaged. Lastly, always turn your lights off when you aren’t home! 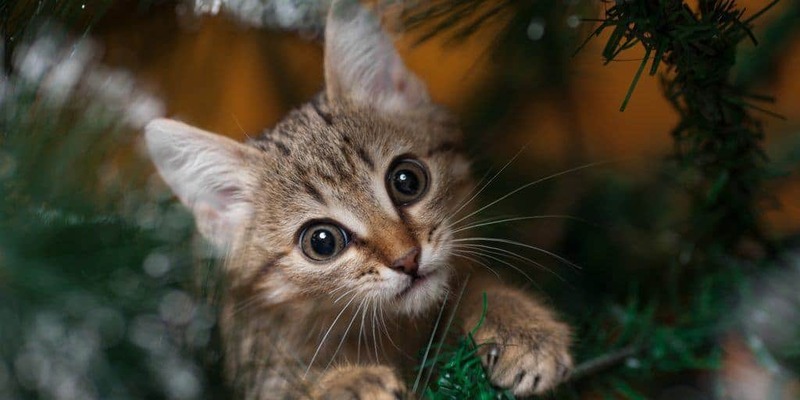 Taking a few extra precautions will ensure both you and your cat are able to enjoy your Christmas tree – without destroying it! 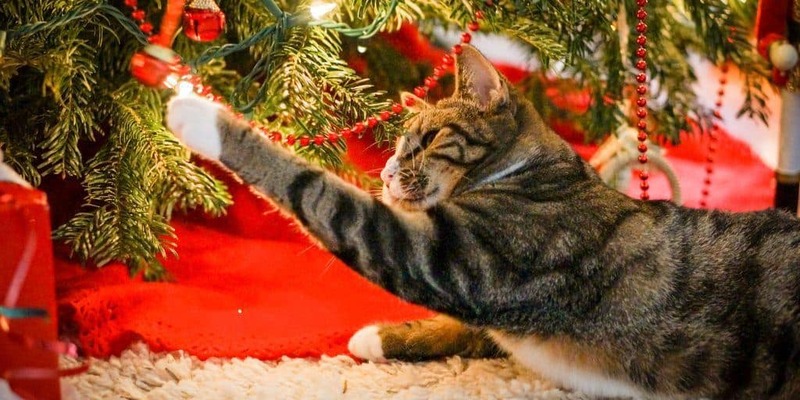 16 Cats Who Are Trying to Destroy Christmas! I gave up. Now I decorate the Cat Tree that will not fall over–one string of lights, a star on top, and one stocking. Looks very Christmassy and will not fall over when they climb it. May I put a link here so you can check out my article about cat proofing the X-mas tree? Please, say your opinion and let me know what should I change. PS: I wait for your approve.